Learn the difference between how positive and negative values are displayed in PocketSmith. Expense transactions and negative account balances are displayed in PocketSmith with brackets surrounding them. Expense budgets on the calendar are not displayed with brackets around them and instead are displayed in red. However, if you select the option Show actuals in history - this will display actual transactions (either credits or debits). Any expense (debit) transactions will be shown with brackets around them. Negative account balances are displayed with brackets around them. After selecting the option on the calendar - Show actuals in history - figures are displayed showing the total value of actual transactions that were made in each of your accounts. 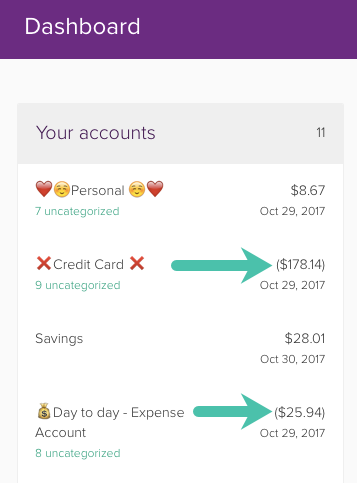 Debit values are displayed with brackets around them. 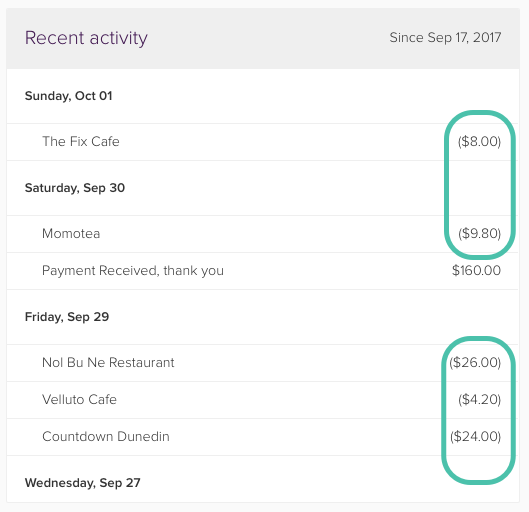 If money has been transferred between two accounts and both accounts have been selected to display on the Calendar (from the left sidebar), these values will show in black.